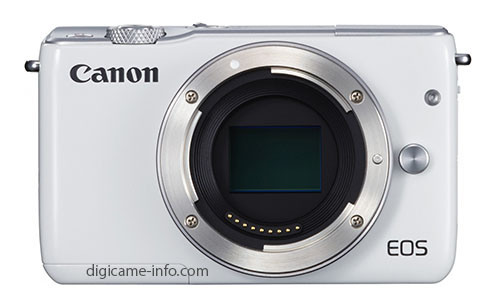 The soon to be announced Canon EOS-M10 mirrorless camera is available on Canon USA eStore. The new Powershot G5X , Powershot G9X and EF-M 15-45mm f/3.5-6.3 IS STM kit lens are also available. The new camera comes in black, white and gray colors. Step up to EOS camera quality in a simple and easy-to-use package! The EOS M10 camera combines a lightweight, compact design with the power and image quality EOS cameras are known for along with the versatility of interchangeable lenses. Inside is an 18.0 Megapixel CMOS (APS-C) sensor that’s paired with the DIGIC 6 Image Processor to help capture colorful, detailed videos and photos, even in low-light situations. To help expand creative opportunities, the EOS M10 is compatible with a wide range of compact EF-M lenses specially designed for EOS M series digital cameras, and the extensive range of EF* and EF-S* lenses used with Canon’s DSLR cameras. It also has easy-to-use and automatic settings like the innovative Creative Assist to simplify photo adjustments and help ensure your images are how you want them. Self Portrait mode extends that assistance to help you grab great selfies by adjusting settings that smooth skin tones and artistically blur backgrounds. If it’s too dark for a normal photo, a built-in pop-up flash lights up dark spaces. All these powerful features combine to make the EOS M10 worthy of your attention, while being conveniently wrapped in a slim, stylish camera.